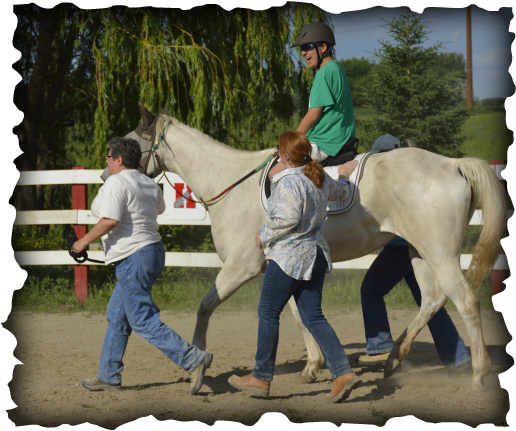 Our “Children’s Program” offers riding lessons to children and young adults with special needs, so they may learn to ride horses confidently and safely, to the best of their ability. To create a safe and respectful environment that encourages riders to enjoy their time with the horses while encouraging them to increase their core strength while boosting their self-confidence. To provide a space where our riders and their families can have fun together. To foster a program where community volunteers help with the emotional and physical growth of our riders. MHR is a place where young riders touch a horse's nose for the first time. Where they can pet a goat or try to touch a chicken. Where they get to walk right up to a "big" horse and get on to ride - showing the world they are brave and adventurous. They leave behind everyday troubles and get the joy of riding on a horse, in a non-judgmental environment where community volunteers help to make each ride safe and enjoyable. Our program began in 1997 with a handful of children and we now serve over 125 riders per season. As we look forward to our 22nd year of service, we hope to expand the number of program horses and the activities that we offer. We are located on a beautiful 106 acre ranch where the horses have plenty of room to run, barn cats and friendly dogs roam about looking for love, and city folks can see how hay gets made. Our classes run May through the end of October in (3) seven-week sessions [Spring, Summer, & Fall]. Our Spring and Fall classes are held only in the afternoons, while Summer classes offer some morning classes as well as afternoon. Paperwork for registration is located on the “Paperwork” and registration for the year begins in March.